Andrew Garcia lifted the top of his Starbucks coffee cup and poured the remains in the trash, sighing as he sat back in his seat. Coffee Cookie, a circular, battery-powered device that attaches to the bottom of disposable cups, works to eliminate this issue and keep coffee warm. 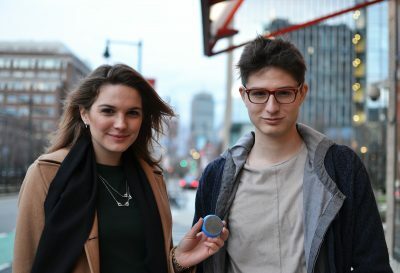 The idea came to Massachusetts Institute of Technology mechanical engineering seniors Gabe Alba and Victoria Gregory when they both decided to create a consumer product that appealed to people’s interests. They successfully prototyped the invention in January and are now getting ready to sell their first batch of 1,000 Coffee Cookies. Despite being full-time students, Alba and Gregory said they decided to take a risk before graduation and see what they could do on their own, feeling the “highest of highs, and the lowest of lows” in the process. The pair made the first prototype out of aluminum and plastic through a process called injection molding, where material is fed into a heated barrel, mixed and forced into a molded cavity, creating the Cookie’s casing. After a month, they made prototypes of the circuit board located inside the Cookie and had them made in China, as well as their batteries, which were recommended by an MIT alumnus. A switch on the bottom of the device turns it on, reaching up to 194 degrees Fahrenheit for up to 15 minutes, and keeps the liquid at the same temperature as when the Cookie was switched on. The one-size-fits-all device turns off automatically as soon as the max temperature is reached. Gregory added that she was surprised that such a device didn’t exist already. “Considering people buy coffee for three to four dollars, it seems like a waste to get another cup,” she said. The first batch will be sold to Oregon State University and the University of San Diego after they receive their last shipment of circuit boards from China, they said. Safety is important for consumer products, Gregory said. After speaking to several manufacturers and testing different samples, they said they are confident about the quality of their batteries and circuit boards, which have protection in case something happens, in which the battery gets disconnected. Greg Blonder, a product design and manufacturing professor in BU’s College of Engineering, said one of the best predictors of success as an entrepreneur is starting at a young age, but he mentioned that there are challenges they will face. Cognitive dissonance between the Coffee Cookie and the way people use disposable cups will affect the demand for this invention, Blonder said. “You’re going to have to remember to charge it, and bring it back the next time you need it,” Blonder said. “If you don’t remember, it’s useless and goes in the drawer,” adding that he doesn’t believe people will carry the Cookie around. He also advised against marketing their invention as a consumer product and instead to market the Cookie as a direct sell from coffee shops. Alba and Gregory received $10,000 in funding from the MIT Sandbox Innovation Fund Program, which started providing seed funding of up to $25,000 for original student ideas in 2016. They also received a provisional utility patent, which gives them the right to prevent others from making, using or selling their protected invention. Alba and Gregory said they want to come up with a new way to launch products that’s less about corporate conglomerates and more about individual, localized brands. “These big companies are trying to be one of the kids, but I think the advantage we have here is that we’re actually one of the kids,” Alba said. They are planning on establishing a manufacturing facility in Mexico so they can oversee their production and eliminate the language, business and time barriers that China often has.